Versa Stone delivers the new look in solid surface tops and sinks. Whether you choose the Matte white or solid white finish, Versa Stone's pure acrylic composition boasts anti-scratch and anti-yellowing technology. Pore less, seamless and easy to clean, Versa Stone is as easy to maintain as it is easy on the eyes. Versa Stone: a versatile, smart choice for the modern bathroom. Update your bathroom with the Avanity 25-inch sleek Vitreous China Vanity Countertop with integrated rectangular basin. Featured in a classic white finish to blend flawlessly with your decor, this vanity top offers clean and simple transitional styling. Its seamless, 1-piece design also offers ample counter space and is easy to clean. It comes pre-drilled for standard single faucets. 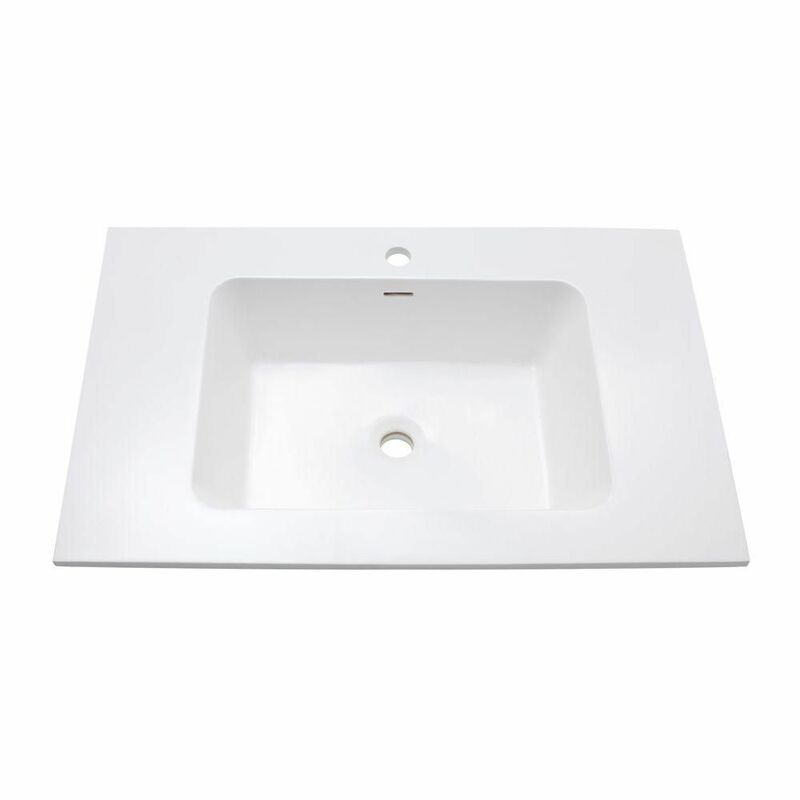 Update your bathroom with the Avanity 31-inch sleek Vitreous China Vanity Countertop with integrated rectangular basin. Featured in a classic white finish to blend flawlessly with your decor, this vanity top offers clean and simple transitional styling. Its seamless, 1-piece design also offers ample counter space and is easy to clean. It comes pre-drilled for standard 8-inch widespread faucets. Add understated elegance to your bathroom with the Delano Collection. Spare in style, we designed Delano to accent a range of bathroom dicor, blending simple beauty with unmatched versatility. Whether you choose the Taupe Glaze or White Finish, the 30-inch Delano features a durable solid wood frame and sophisticated black bronze pulls, 1 flipped down DWR and 2 functional DWRs. The combo includes a durable black granite top and rectangular white vitreous china sink. VersaStone 31-Inch W Solid Surface Vanity Top in White Versa Stone delivers the new look in solid surface tops and sinks. Whether you choose the Matte white or solid white finish, Versa Stone's pure acrylic composition boasts anti-scratch and anti-yellowing technology. Pore less, seamless and easy to clean, Versa Stone is as easy to maintain as it is easy on the eyes. Versa Stone: a versatile, smart choice for the modern bathroom.